June 2014 Archives - Newman Dignan & Sheerar, Inc. - Providence Fee-Based Financial Advisors June 2014 Archives - Newman Dignan & Sheerar, Inc. The old expression – Don’t Fight the Fed – seems to be alive and well. Dovish comments from Fed Chair Janet Yellen sent most markets to all-time highs last week. For the week, the Dow Jones Industrial Average finished at 16,947.08 to close the week higher by 1.02%. The broader-based S&P 500 closed at 1,962.87 for an increase of 1.38% for the week. The Nasdaq Composite jumped 1.33% to close the week at 4,368.04 (still 15% off its April 2000 high). International markets finished higher, but slightly trailed U.S. market gains as the Dow Jones Global (ex US) Index advanced 0.62% for the week. After last week’s gains, market averages are higher for the year-to-date period with the Dow Jones Industrial Average up 2.2% and the NASDAQ ahead by 4.6%. The S&P 500 is showing higher year-to-date gains as it is up 6.2%. The 10-year Treasury was relatively flat to close the week at a yield of 2.63% … up a bit from last week’s 2.60% yield. Economic news released last week was reasonably upbeat – stronger-than-expected Industrial Production, Capacity Utilization, NAHB housing index, and Philly Fed and Empire State manufacturing series. On the softer-side were May Housing Starts and Permits (a bit worrisome). M & A activity got the market excited as Medtronic announced a $42.9 billion buyout of Covidien. Other M & A activity included Level Three / Time Warner, SanDisk / Fusion IO and Williams / Access Midstream Partners. We expect gasoline prices to move higher in the weeks ahead given the mounting tensions in the Middle East. A gradual move higher could be absorbed by consumers and businesses, but a spike in prices would be a negative for the ongoing economic recovery. Markets have been fairly calm lately, but don’t be surprised by an occasional downward swoon in the markets … we are way overdue. Summer has started … don’t forget to get out enjoy the beautiful weather. While the stock market chugs along quietly with low volatility, measures of economic activity show continued improvement. The Institute of Supply Management produces two important economic indices of activity; the index of manufacturing and the index of services. In May the index of manufacturing reached a five month high of 55.2, well above its winter low of 51.3. Any number above 50.0 means the manufacturing side of the economy is growing. The index of services which hit a nine month high of 56.3 and was well above its February trough of 51.6. The auto industry also showed signs of growth-its annual rate of sales was 16.8 million, the highest since June 2006. The average year to date is nearly 16 million. As a local anecdote, we are amazed to see the number of Chevrolets in downtown Providence, whereas we typically see mostly imports. 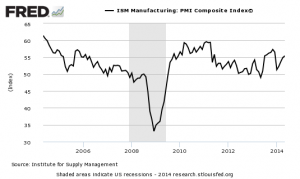 Employment data for May confirms the ISM data. Non-farm payroll employment rose by 217,000. The unemployment rate remained 6.3%, which surprised many economists because it had dropped so precipitously in April. Non-farm payroll employment surpassed its pre-recession peak. Employment has risen by 8.8 million to an all-time high of 138.5 million, and Government employment is one-half million jobs lower than in 2008. One clear negative in the data was the trade deficit for April. It was the largest in two years. This deficit is a negative for the GDP calculation since the lower domestic production is a driving force in calculating the GDP numbers. Putting everything together, we still see indications that the second quarter for Gross Domestic Product can bounce back from the negative number for the first quarter to three percent in the second. The Stock Market continued its unassuming advance last week, with the Russell 2000 advancing 2.7% and the sluggish DJII climbing 1.2%. Year to date, the market is up 5.5% as measured by the S&P, or 2.1% according to the Dow. The Non-farm Payrolls came in as expected at 217,000 additional workers, but hourly earnings increased at a still sluggish 0.2%. This consensus result was, as far as the stock market is concerned, just what the doctor ordered. Higher numbers would lead to faster policy tightening by the Federal Reserve, while smaller increases would lead to concerns about the economic “recovery”. Last week stocks continued their slow upward movement with the S&P 500 finishing up 2.1% for the month of May, the 4th monthly rise in a row. The Nasdaq Composite was up 3.1% for the month. Friday’s economic news was mixed with U.S. consumer spending falling 0.1% in April and April personal income rising 0.3%. This week the major economic news item should be the jobs report due on Friday. Current forecasts look for an increase of 215,000. Perhaps the biggest surprise this year has been the decline in interest rates, the 10 year Treasury note started the year at 3.0% and ended May at 2.46%. Most forecasters at the beginning of the year were calling for an increase in interest rates based on an improving economy. First quarter GDP has been revised to -1% and most people are blaming the weather, but maybe the bond market is trying to tell us the economy is not going to be as strong as consensus predictions. Keep your eye on the economic reports for clues as to strength of the recovery.